2. 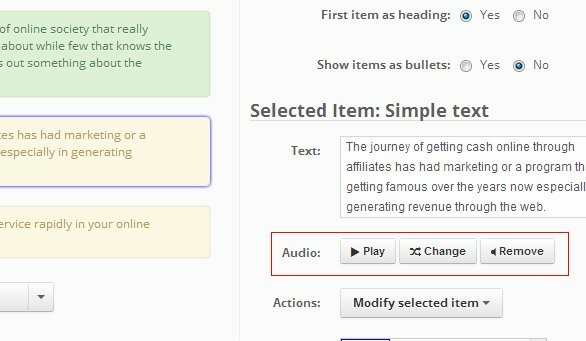 Change – Selecting this button will bring up a popup which you can use to change the audio associated with this text item. 3. Remove – This option will remove any audio playing with this text. If no sound is associated with this item you will see only a single button titled "Add Text to speech or Record voice". Clicking on this button will bring a popup similar to one associated with Change button. The default option is Text-to-speech voice generation option. 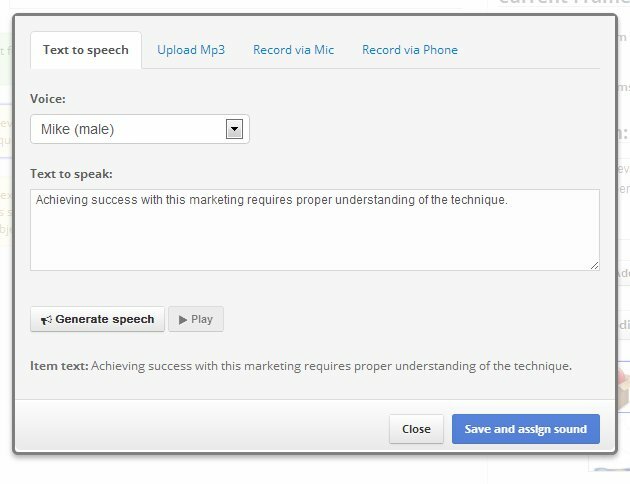 You can edit the spoken text and voice from here and regenerate your voice over. If needed, you can even spell out a word phonetically to improve the quality of voice-over. You can use the "Upload MP3" tab to upload your own MP3 as well. You can also record your own voice over with a microphone or record it via phone as well.